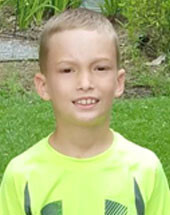 Harley is an outgoing kid who loves being around people and helping others. He has an infectious smile and a kind heart. When it comes to basketball and baseball Harley is a sports fanatic. His hobbies include playing video and computer games, reading, building legos, and collecting Pokémon cards. His favorite colors are red, black, and yellow. Harley has a big appetite and his favorite dish is gumbo. He is a 5th grader who loves reading and maintains average grades. He is looking for a forever family who is willing to receive all the love he has to give.